Reproduced from the Spring 2013 edition of Plentiful Redemption. By Rev. John McGowan, C.Ss.R. We fasted from food and drink from midnight until Communion time the next morning. We went to confession weekly or monthly where every confessional had lines of penitents. We enjoyed Low Masses, High Masses and even Solemn High Masses with three priests serving as celebrant, deacon and sub-deacon, respectively. Black was the color of the vestments at funerals. Priests were the only ones who gave us Communion, and that was from a marble rail that kept us in our place and away from the sanctuary floor. 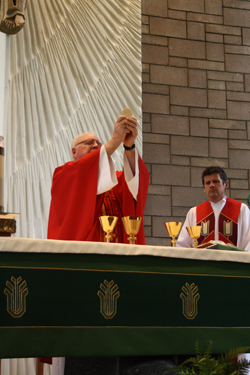 Our Sunday Masses were standing-room only, and often Communion was distributed from the Offertory to the “Agnus Dei.” We had to be at Mass before the Gospel in order for it “to count.” Our Sunday sermons usually treated of Catholic doctrine, morality, virtue or sin. Only priests and religious had “vocations.” We truly believed that we belonged to the one, true church that was forever changeless. Then the windows flew open and the fresh air of the Holy Spirit arrived. For me, personally, the greatest gift of the Council was the universal call to holiness. All of us are called to be holy, and we all make up “the Body of Christ.” This came across especially when the Council called us to full, active participation in the celebration of the Eucharist. Sacred Scripture was given a prominent role at each Mass as we listened to “homilies” reflecting the readings. Priests now faced the people and celebrated Mass in our language. 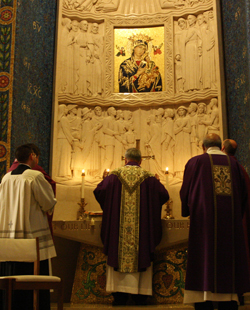 Concelebrated Mass took precedence over several Masses going on at the same time on different side altars. I lived my pre-ordination time in Council of Trent years and my ordained days in the Vatican II years. I was happy during both periods, but I thank God each day for the countless blessings that the Holy Spirit brought and continues to bring to each of us and the Church because of the work and the documents of the Second Vatican Council. Fr. McGowan professed vows as a Redemptorist in 1957 and was ordained in 1962. He is currently stationed at San Alfonso Retreat House in Long Branch, NJ.